And let’s not forget…the veritable mine-field that is testing and promotions. My personal never-to-be-repeated disaster is the time my shipment of yellow belts didn’t arrive in time for graduation day. Lesson learned! Now I order weeks in advance. And that isn’t as bad as an in-class injury… After twenty years, you get an impressive list! Thanks for your comments Chris B. Yes, you are so right about the disasters on grading day. I have also learned a few lessons about ordering belts, etc. before grading. 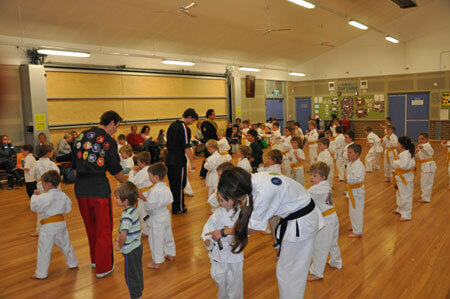 Intensive preparation is the key to successful gradings. It takes work! The lesson there is: Have a system; prepare in advance, because the test day will be very busy. And above all, have a written list – and use it! Thanks Didi for your insight, I think we all have grading horror stories. I forgot all the belts once and had to rush back to my house to pick them up while one of my senior instructors took the warm-ups and the first part of the grading. So embarrassed! I agree with this list in it’s entirety but I do feel that one issue has not been addressed. I know I have fallen victim to choosing one child in the class as a favourite before and I am now striving to make sure every student is treated equally. It’s always easy to like one more than the others but the trick is seeing what every child is able to bring to the table. But that’s just my 2-cents. Very good article Matt and Didi! Excellent point Grant! We are only human, and you can’t help favouring students that put forth 100% percent and seem so glad to be there, while others, well, they just make your day a bit harder. But yes, you still have to treat them equally. That student who does not really want to be there might some day be a leader in your organization. I have seen it happen. Sound familiar Grant? My son is 8 and he’s now yellow belt/6th kyu in our organization. That is HIGH level to me: when I was a high school kids and started practicing karate – our TEACHER was yellow belt. Now, I understand kids at this age are not to be expected perfection from. But when technique is really sloppy, where do you draw the line? Using words that young kids understand is also important. I got caught out by asking a 6 year old to do a 90 degree turn. He looked puzzled and thought degrees was something to do with oven temperatures (he liked baking with his mum). I also talked about doing a drill to a 6 year old who was also puzzled as a drill was something his dad used to put up shelves! Hi Sue! So true about the vocabulary, and I find less talking and more action also works with the kids. They hate inactivity! I can understand your frustration with a yellow belt teaching the classes. They will form poor habits which will be impossible to correct as they move up through the ranks. I would have thought about changing schools. Thanks for your comment Sasha! Thanks, everyone, for raising some really important points we didn’t make in the original list. Showing favoritism is a big “don’t” – and as Matt said, it takes some care to give equal treatment when kids are so different from one another, and so different in their efforts in class. Besides the “star” and the “troublemaker” – don’t forget the quiet, nearly invisible child you might lose because you don’t notice them often enough – especially if you have large groups. I love Sue’s vocabulary examples – hilarious! I often use big words, sometimes with funny results. I can’t seem to change my habit, so instead I make a practice of asking the kids if they know what that word (whatever it is) means, and it becomes part of the lesson. I learned early on that if the kids aren’t following my instructions, it’s often because they misunderstood the words in some very clever way! Sorry, sensei, I’ve confused you. 🙂 The teacher I mentioned – I hold in high regard and from those years 6th kyu means a LOT to me. But now my son has the same rank – while the technique is far from that level. But at the same time we’re talking about not expecting perfection from kids… So, that’s where I’m frustrated and don’t know where the line should be drawn and the student shouldn’t be graded/promoted until there is serious improvement. Wow what a great topic! Sue – I also use “part of the lesson” as a vocabulary exercise – but in a fun way having the students remember or guess (like a game). The most important thing IMO is helping kids with positive criticism not negative. Encouragement instead of discouraging them. This helps boost their confidence and helps them succeed instead of setting them up for failure. Giving the class your full attention is extremely important too – Good point Sensei Matt. I have seen in a few schools the Head sensei bow the class in then assign tasks then go eat, practice their own stuff or just not get involved AT ALL in their own classes. Parents mostly stay at that dojo because they like or agree with the head sensei, how he goes about teaching, the results they see in their kids and the general vibe in the Dojo. If the head sensei is not as solid as a rock that makes people uneasy and takes away that “structure” so to speak – in the end, you will lose students AND credibility. Value and content – It is important that Students and Guardians feel like they are getting value, not just from a monetary point of view but in the content. People are savvy and do want value for their money but if the content is poor and nothing special – what is the point of staying even with good volume of product – quality wins everyday of the week. The students who are there for the quality – THEY are the ones you want, with the right attitude and will be the most loyal students you will ever have. Hi Zoltan! Glad you enjoyed the topic, it has been one of our most popular thanks to your input and the feedback from others above. Thanks Didi! So true about maintaining a positive attitude and the personality and personal involvement of the instructor is key. Children feed off our enthusiasm or lack thereof. Perception of value is the name of the game in any business, but especially when dealing with kids, as all parents want the best for their children. Thanks for your insights Zoltan.